Bluestacks app player is software for application designed to run android applications and games on Windows 7/8 PCs and Mac. This Bluestack emulates the android OS within its own environment. In some cases u may wanted to access files from windows to Bluestacks and vice-versa. Here I have listed some common cases u may encounter for moving files b/n bluestacks and windows. Moving games Obb/Data/Sd card files B/n Bluestacks and Windows as I showed while installing this Asphalt 8 for PC game. 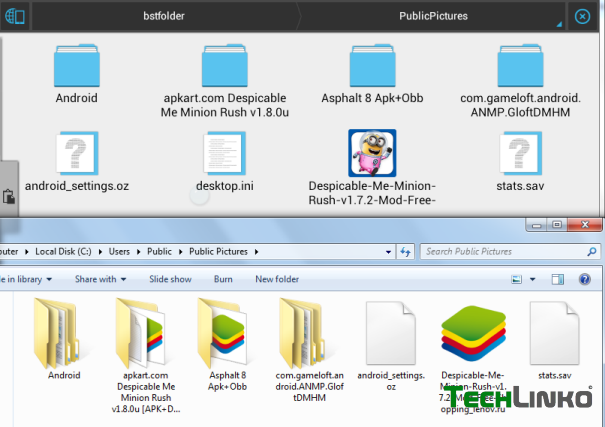 Download and install any File explorer(Ex ESExplorer) in Bluestacks emulator and install it. Use copy or move function to transfer files from “Sdcard/windows/PublicPictures” to “sdcard/android/obb” for Obb, “Sdcard/” for Sdcard, and “sdcard/android/data” for Data folders respectively. For example here is a video I created an Asphalt 8 lovers who wanted to play Asphalt 8 for PC like Windows 7/8 using the above method and it works fine. And it’s the easiest method we don’t need to alter any Registry files, any rooting or increasing SDcard file size in Bluestacks. bluestacks is just awesome, nobody can even match how it works. Wen I go to bluestacks n open es explorer the location sdcard/windows/public pictures is not found. can u show a video on how to play plant vs zombie 2 using this method??? i come from malaysia and i cant download this app directly from app store..
i have download the file but i dont know what to do with that file..
even i cant find ???? Hi Thank's for the comment as per the new bluestacks functionality you can locate all the files of C:\Users\Public\Pictures in Sdcard/windows/PublicPictures location of bluestacks ES explorer..
For those who cannot open windows folder. After you copy the files in C:\Users\Public\Pictures, go to bluestacks and open ES file explorer. Then go to SDcard/DCIM/SharedFolder and you will see the files there. Then you can copy those files and paste into the Android/obb or wherever you need to paste. Touch and hold on the file that you wanted to copy...It will show The Options..See the Video i have made for installing Asphalt 8 on PC You will get the idea.. I am not able to find "bstFolder" in Bluestack. I already downloaded ES File explorer from google play. Thankyou so much.. it work grt. I have bluestacks installed and it works if I download things like games but I want to use it whit instagram ..but no way I've followed any kind of video ...installed explorer, copied photos in program data - bluestarck - user data -shared folder then started explorer in BS opened sdcar but ... no bstfolder ... nor works do what they do explain here http://support.bluestacks.com/hc/en-us/articles/203081537-How-to-Access-Files-on-your-PC-from-BlueStacks- ... beacuse I cannot open windows (it stuck )... what should I do? I did all the steps and copied it. i moved a wwe immortals obb file but its still not showing in the bluestacks apps. how will i be able to play it. Please let me know whether you installed the application or not..Thank's for the comment..
Hi I can't get it what means the part "transfer files from “Sdcard/windows/PublicPictures” to “sdcard/android/obb"
should I create a android/obb folder in sdcard by file manager? HI SIR, EVERYTIME I COPY THE OBB FILE FROM THE PC TO THE SDCARD FOLDER IT SAYS THE FILE CANNOT BE COPIED. I TRIED TO COPY PICTURES AND IT WORKED. hi manohar bro.. few days back i was upgraded my windows 7 to windows 10.. now im not able to copy the obb file from pc to sd card folder. need your help. thanks in advance. There is no folder whose name is sdcard/android/obb thee is only sdcard/android/data. How can I use obb games? theres nothing in the publicpictures folder and i have 3 (4 if you include the file manager) apps! you said in step 1 Copy files you want to access in bluestacks from PC to This location “C:\Users\Public\Pictures”. how do I do that? I used first bluestacks, I was amazed with this awesome app. I followed the steps mentioned and it turns out well. Best blue stacks guides Thanks! which is not opening now what can I do? When I go to start my game "Sanitarium" it says it "needs enough memory to extract the files it downloaded" and I've uninstalled everything that's non-vital. What do I need to do? how much views do you get and how much do you earns from adsense? DO NOT FOLLOW THIS! THIS IS MISLEADING!